A GREAT title should Grab the attention and peak the interest of the reader, pulling them in and making the desire to scroll down or click through irresistible. If you are not too worried about ranking your website and rely on social media and paid advertising for your traffic, then creating a face-slapping, attention grabbing and banging headline is the only consideration. If all you are interested in is getting noticed by google in an attempt to get the site ranked and drive organic traffic to the site then the composition of the title is the most important. In reality, most of us want a combination of both. 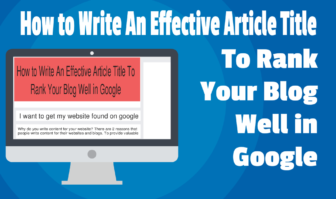 Learning how to write an effective title, is as important as writing great content. Not only does the title have to be eye catching but, it also helps a lot if it is structured in a way that google loves.